Secondary schools will take over Lake Tikitapu from March 26 to March 29. Image: Supplied. More than 1950 students from 123 schools will take to the water next week to battle it out at the 2019 National Secondary School Waka Ama Championship. This year, 200 more students will take part than the previous year. For the first time, over 120 Schools will take part from the Far North to the top of the South Island. 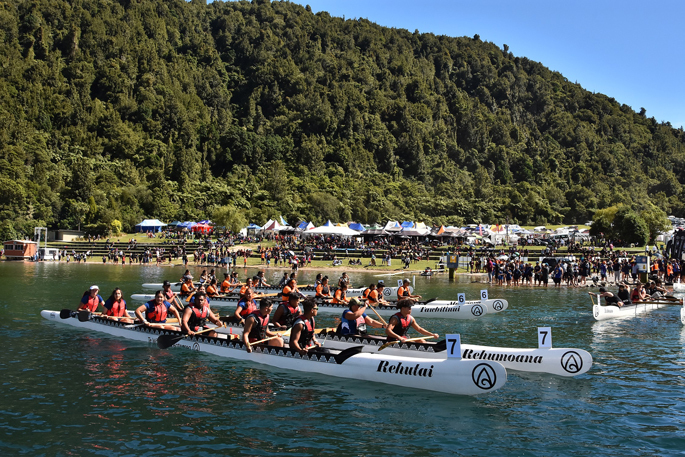 Now in its 18th year, the championships are being held from the March 26 – 29, at Rotorua’s Tikitapu - Blue Lake. Chief Executive of Waka Ama New Zealand, Lara Collins says the event has grown from strength to strength each year over its 18-year history, with 2019 set to be the biggest and best yet. “It’s wonderfully unique and exciting for spectators too. Tikitapu - Blue Lake, is usually a serene and tranquil spot, but when the championships descend, it turns into a place of energy and excitement with cheers ringing from the lakeside and the most stunning backdrop anyone could ask for,” she says. For the 9th consecutive year College de Pao Pao who travel from Moorea, Tahiti to compete as an International contingent will attend the event. This year they will bring one U16 Boys team and two U16 Girls teams. Schools are competing for national honours in one (W1), six (W6) and twelve paddler (W12) teams over distances of 250 and 500 metres. Teams competing in the six person 500m classes will also have to navigate their way through a hairpin turn at the halfway mark. The Event is hosted by Te Waiariki Purea Trust who have hosted the championships with Waka Ama New Zealand since 2005. This year the event will be a part of the Rotorua Waka Festival with a Kapa Haka Super 6 competition is being held Thursday 28th March at Te Manawa in Central Rotorua for the School Waka Ama teams to take part in. Also the Hoea ki Mokoia event Saturday March 30 have included a secondary school section of a race that sees paddle around iconic Mokoia Island from the Rotorua Lake front.